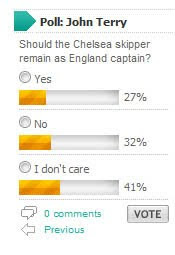 Just came across this poll on the Get Surrey website. I think this may be a signal that the chatterati in this fine country of ours have finally given up their interest in dull celebrity. From now on the pubs and living rooms of the nation will be filled with the sound of discussion and analysis of political issues such as economics and civil-liberties and debates about cerebral philosophical stuff. Have you seen the pictures of Jordan on the front page of the Sun??? I can't beleieeeeeeeve she got married again already. Look at the state of 'er - she is mingin'.